The following is a guest post written by Ashu Garg, general partner at Foundation Capital, with special advice from Julie Bernstein, COO for Stitch Fix and former CMO at Sephora. 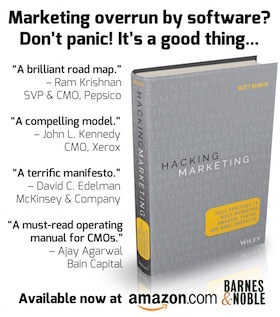 Ashu is the author of MarTech and the Decade of the CMO. I get pitched all the time — and I’ve heard it all. From the good to the bad, to the disastrous. As an early stage investor in martech companies, it’s part of my job to get pitched and to help the companies I ultimately invest in make stronger pitches to their prospective clients. I also regularly meet with CMOs and marketing leadership to better understand their needs and wants in a marketing partner. Recently, I had the chance to speak with Stitch Fix COO, Julie Bornstein during our MarTech and the Decade of the CMO event in SF, and she offered some great advice as to what makes for a solid CMO pitch, and some pitfalls to avoid at all costs. I’d like to share some of her insights with you, as well as some of my own that I regularly share with entrepreneurs. Describe what you do in one succinct, well-articulated sentence. To get a positive reply from a CMO or pass-along within an organization, you’ll want to stand out. Here’s a good rule of thumb: if your mom or dad could understand it, you are on the right track. Don’t offer CMOs an easy, breezy, free trial. Understand that a free trial will cost the CMO and their team time and resources they can’t always spend trying out your product. Instead build an intellectual partnership first, and decide on the parameters of a trial period later. If the CIO or product team needs to be in the meeting, it’s the CMO’s job to determine that—not yours. Having the right team in the room will make for a more focused conversation for their business and your pitch. Why leave it to the CMO? As I discuss in my whitepaper, MarTech and the Decade of the CMO, CEOs are already giving the CMO and CIO relatively equal importance on driving digital. And Gartner reports, by 2017 CMOs will begin to spend more on technology than their CIO counterparts. The CMO is focused on driving business through their marketing and technology initiatives. In fact, as I cite in MarTech and the Decade of the CMO, CEOs surveyed by Gartner singled out their top three business driving initiatives all fall under the purview of the CMO. So instead of focusing your attention on solving marketing problems, solve business-critical challenges. Whether you are getting ready for your first pitch at a new startup or you are a seasoned founder looking to hone your story for the C-suite, we hope these tips are as useful to you as they have been for the entrepreneurs I work with here at Foundation Capital. Thank you Ashu and Julie! Great post, and I agree with every point! Love your point #5. I cringe at the thought of taking another call from a potential supplier where the rep starts out the call by asking me to explain my business to them. Even worse is when after I explain my business to them, they launch into their canned presentation anyway, with no adjustment or explanation as to how it applies to the business situation I just explained.